It's incredible that this is a thing. Disney is wild. Now...where is my X-Women show? Now...where is my X-Women show? Can't She-Ra's VA actually sing? I'd rather have her as Dazzler then Chelsea Handler (if that ends up being the case) . Disney takes over the rights to the X-men and this is what we get? God help us all. This is weird, it'll either be fire or an absolute train wreck. I see a lot of disdain for Tigra here. I've always loved her. Actually, I appreciate her much more than Dazzler. Oh. My. Lord. This is WAY out of left field! Not my preferred choice for Dazz's reintroduction into animation, gotta say, BUT... after the shock wore off, it seems pretty Deadpool-esque in nature, with some Archer feels thrown in for good measure. So I'm just gonna roller skate with it, and try & embrace the absurdity. 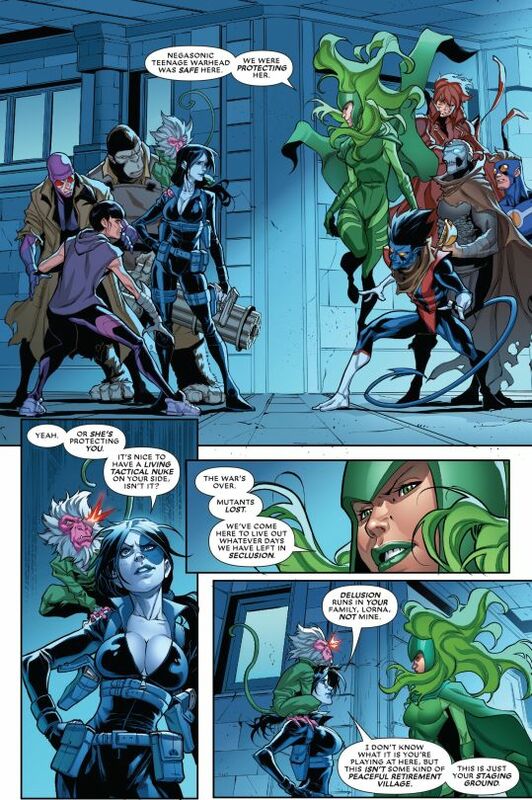 Like how everybody eXcept the oblivious Tigra, is side-eyeing creepy, lil' Land of Oz reject, Hit Monkey. Per the promo pic, Ali's got attitude & some swagger, so that certainly seems in character. Consider me officially Offended, in a cautiously enthusiastic way, and don't be surprised if Wade Wilson is the eventual, wait & see Team Leader. Last edited by Heroine Addict; 02-12-2019 at 05:19 AM. Welcome to the Disney X-Men World! There is one Mutant represented Dazzler Disney's Ultimate Spider-Man had more mutants on it with episodes guest starring Wolverine and Deadpool. So I don't see how this represents "Disney's X-Men World"
I like Dazzler and Tigra, so I think I’ll give it a chance. ....More and more I'm starting to think this is a typical day in marvel's various offices. Hopefully, the show will do well in-spite of outward appearances. However, I really wish Marvel would give us a cartoon/show that you know off the bat will be good, respect the characters, respect their history, and cartoon show that all Marvel fans can rave about as a unit. DC has been able to do this not ONCE but a total of SEVEN times. While Marvel's greatest project is still 90's X-Men animated and almost Avenger: Earth Mightiest Heroes.